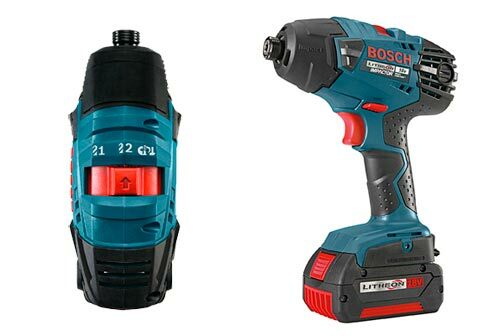 Bosch has combined the best of a cordless impact driver with the things you need with a cordless drill to bring you their new 3-Mode Impact Drill/Driver. This new tool has the look and feel of a regular impact driver, and even uses the same 1/4” hex chuck, but the ability to turn off impacting with the flick of a switch is what makes the tool special. Most people do not want to have to carry around both an impact and a drill and if you are running large screws, an impact is the way to go. The problem is when it comes to drilling. Impacts do an OK job at drilling, but the impacting really slows down the process and can leave you with some ugly holes. Flick over to drill/driver mode and you are all set. The drill/driver mode will also allow you to install soft metal screws without breaking off the heads. An added bonus, because this is an Impact at heart, is the extra amount of RPM's you will get for drilling, 2,800 RPM vs 1,800 with a standard drill.